Sleaford Sports Amateurs were brought crashing back down to earth on Saturday after receiving their Lincolnshire League team of the month award. Amateurs received the award before kick-off for their form and results in December and January, but Immingham Town responded by dishing a 5-0 hiding. Ben Cooke got the ball rolling in just the 10th minute before Liam Van Der Weele doubled the lead. Carl Price all but killed off Sleaford’s hopes 10 minutes after the break with the third, before John Waugh’s late double sealed a convincing win. The defeat saw Amateurs slip to seventh place and without a win in three matches. They will look to put this right on Saturday when they entertain second-placed Horncastle Town at Eslaforde Park. Kick-off is 2pm. 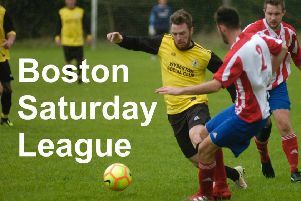 Grantham Sunday League Arion Premier Division: Rippingale and Folkingham 4-5 Helpringham Rovers; Osbournby Rangers 2-1 Nobody Inn Athletic. Arion League Division One: Nobody Inn Athletic Res 3-4 Ingoldsby; Pointon Sunday 5-1 Ancaster.